A generalised FRAND Model enables users to independently assess economic value of asserted portfolios. As connectivity brings value to many sectors such as automotive, IoT and industrial automation these sectors increasingly face the challenges of Standards Essential Patents (SEPs). Embedding connectivity / communications into a product opens the door to claims of patent infringement of wireless standard essential patents, which can exposure product owners to claims for patent royalties. The regulatory environment for patents is changing, as are approaches to licensing and issues of FRAND and royalty setting. Organisations adopting connected solutions should embrace the technology with the right IP strategy plans in place to manage the potential IP risks. Many SEP owners adopt “traditional” arguments based on uses of the technology in mobile phones – allowing users to make regular phone calls. For new players in other sectors, these arguments do not always make sense: automotive connectivity is often used for exception cases – emergency calls, or breakdowns. The “Theory of FRAND” adopted by any one licensor must be understood and put into the context of the wider landscape; royalty demands must be extrapolated across the entire stack of SEPs, and potentially across all relevant standards in order to identify a total cumulative rate for the alleged infringing product; and as willing licensees any counter offers must themselves be seen as FRAND. 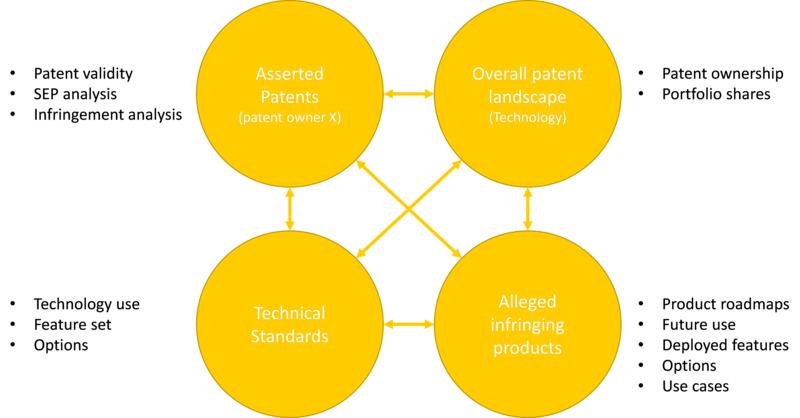 The challenge is to counter patent claims with an understanding of the relationship between the patents (both the asserted portfolio and the wider landscape), the technology and the products. Knowing the relative size of the patent landscape, the importance of the patents within the scope of the standards and how or even if those features are actually implemented are key steps in developing a defensive strategy. To build an overall view of the royalty stack of the alleged infringing product. Recent court judgements in both US and Europe demonstrate there is an acceptance that a Top-down approach to determine damages / FRAND rates is an appropriate and viable approach. A flexible model allows for scenarios to be built and tested. Sensitivity analysis around the available modifiers allow stakeholders to explore the potential risks associated with particular assumptions. The Honourable James V. Selna, Judge of the District Court of the Central District of California in TCL vs Ericsson. Having a common understanding within the team is an important knowledge building stage, and this process will allow organisation to build issues around SEPs and FRAND licensing into its strategic processes and thinking for future technologies, and future products. Building a FRAND Model will allow all stakeholders to engage in the process to explore and understand the implications of particular assumptions or strategies.